SANTA CRUZ, Calif. (Apr. 9, 2019) — Tepui, the leading brand of rooftop tents and outdoor adventure gear, launches Low-Pro, the lowest profile softshell rooftop tent on the market. 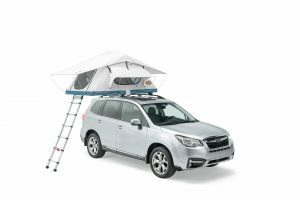 Tepui expands their selection of rooftop tents, adding a streamlined, lighter-weight option to their extensive line of soft-shell and hard-shell tents. Low-Pro utilizes a lightweight Thermoplastic Engineered Construction (TEC) composite base material that is more durable and 100% recyclable. The Tepui TEC composite base and redesigned canopy reduce the weight and height of Low-Pro when the tent is closed. At 7”, Low-Pro sets a new bar for aerodynamic tent profiles. The innovative tent design introduces a curved top and a lightweight, all-season canopy, maintaining the spacious benefits of the iconic Tepui A-frame appearance. Low-Pro is available in two-person and three-person styles. Low-Pro is available on tepui.com and thule.com on Tuesday, April 9, 2019. The two-person model, Low-Pro 2 will sell for $1,399.95 and Low-Pro 3 will sell for $1,749.95.